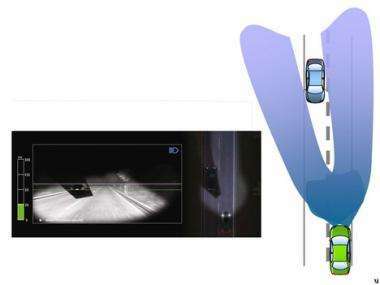 (PhysOrg.com) -- The independent industrial group Valeo, which is headquartered in France, has introduced a "BeamAtic" adaptive headlight system that enables drivers to keep their lights on high beam without dazzling other drivers. High beam provides the most efficient lighting for vehicles, but every time another vehicle approaches or is in front, the lights must be switched to low beam. In the Valeo BeamAtic Premium system, which is also called an “Adaptive Driving Beam,” switching between high and low beams is unnecessary because the lighting is automatically adjusted in response to another vehicle being detected by an onboard camera. In the high beam position, maximum light is maintained everywhere except in zones occupied by other vehicles either in front or approaching. Each headlamp produces a cone of light, but when a vehicle is detected a mobile shield is brought into position to block off some of the light. The onboard camera is equipped with powerful image processing software that enables it to track the trajectory of the other vehicle and ensure the other driver is not dazzled by the high beam. Drivers in other vehicles see what appears to be low beam light, while the driver in the car fitted with BeamAtic sees what appears to be normal high beam light, with the road fully illuminated. The system includes a "Tourism" feature that adapts the lighting for driving in countries in which traffic travels on the opposite side of the road. Valeo says the new system will improve driver safety since objects at the sides of the road are more clearly visible. The system won the International Technical Innovation Grand Prix at the international trade show, Equip Auto, in September 2009. The first BeamAtic Premium headlight systems will be available from lamp manufacturer Ichikoh Industries in Japan from this month, and Valeo is negotiating with Japanese car makers for the system to be included in future vehicles. The Valeo Group is one of the world's top automotive suppliers, producing a range of vehicle components. It has branches in 27 countries and employs 56,000 people. What about multiple oncoming vehicles? Such as in a backed up traffic situation. Also system maintenance would be an issue - the camera could become misaligned over time, dirt/grime could affect performance or the mechanical light blockers could fail or degrade. yes, those are real issues but if this works reliably it will be great. I would like one. I wonder how this would pass Japan's current inspection regime. Headlight angles, etc. are measured to ensure that they aren't shining up into other drivers' eyes. I imagine they would have to modify their testers to ensure the functionality of these systems to pass JCI inspection.